March | 2011 | Oh Happy Dae! The weather last Sunday was pretty spotty. Crummy enough to make me not want to go to the soccer game that day (Wooooo Daejeon Citizen FC!). But after the game started it got just good enough where I didn’t want to stay inside all either, so I decided to head to the market right next to the World Cup Stadium. 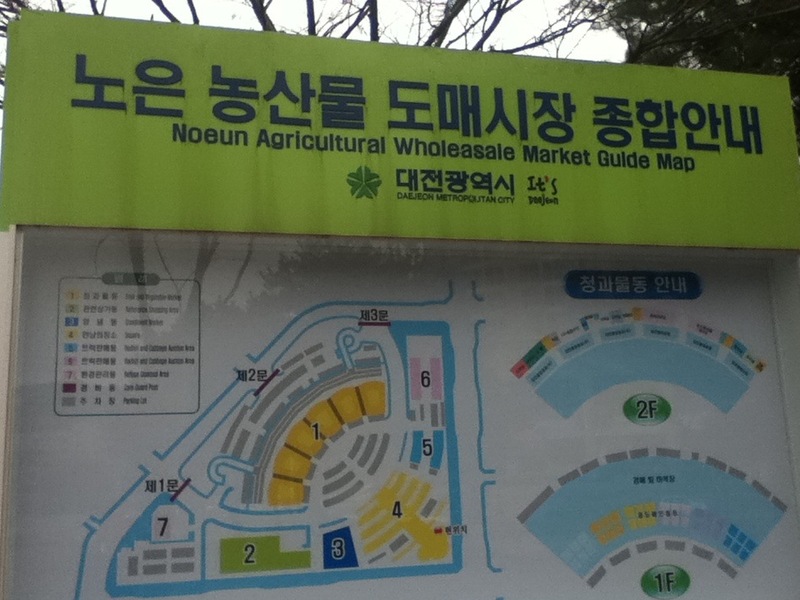 If you get off at the World Cup Stadium subway stop, right outside is the Noeun Agricultural Wholesale Market. There’s a nice map right outside the subway that tells which section is which. There are actually 2 sections dedicated solely to radish and cabbage auctions – 2 main ingredients for kimchi (this is Korea after all). My first stop was Fruits & Veggies since I haven’t been getting much of those. However, I’m not much a cook (yet) so I really had nothing in mind. This section is wonderful though! 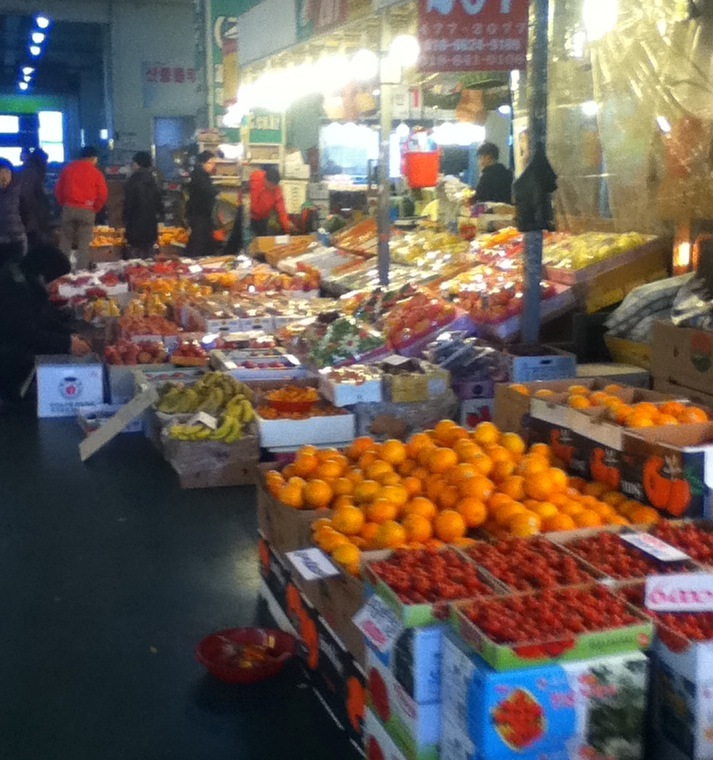 Stand after stand of countless fruits and vegetables. Almost everything is packaged in decent amounts. I merely wandered for about 10 minutes or so. This was partly to check what vendors had and compare pricing. It was also due to my shyness of speaking to shopkeepers in general. They’re very helpful and also a bit aggressive in trying to sell their wares, and of course no one speaks English. I’ve learned key phrases like “How much is it?”, “Give me ____ please”, and the all important “Give me a discount please!” (I haven’t used this ‘cuz I’ve never haggled in my life). I did find a nice stand with delicious looking strawberries. I got a ridiculous amount for 10,000 won (roughly $10 US) and brought them to work the next day. I assure you there isn’t a single one left. 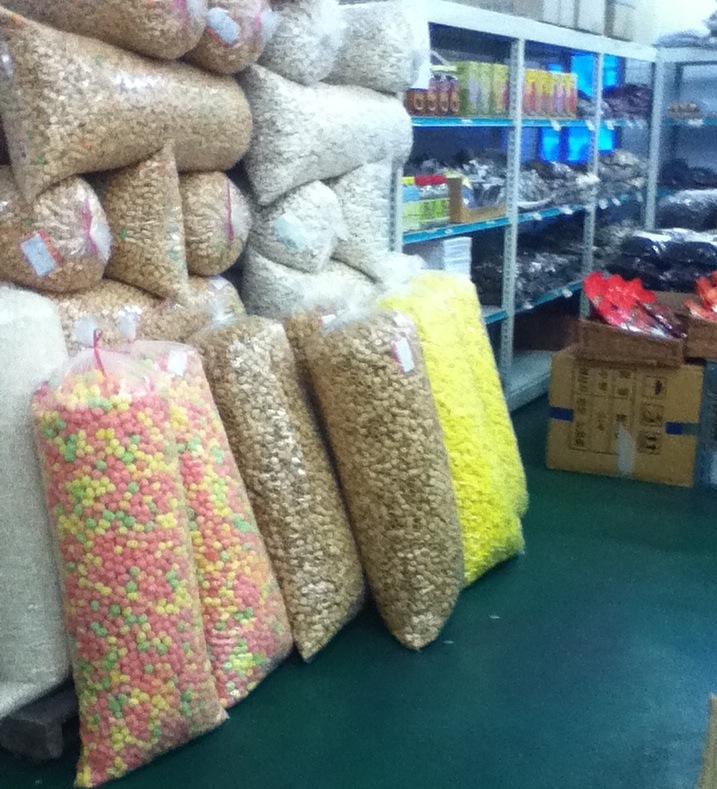 My next stop was a sort of general shop selling things like snacks, seaweed, nuts, and the like. I only walked away with some dried seaweed for my rice, but the bulk “bar snacks” were slightly tempting — if you live(d) in Korea you know which ones I mean. The next stop was the meat shop, but unfortunately I didn’t walk out with anything. As I said before, I’m not really a cook though I want to learn. Also meat here tends to be a little price-y and I’m lacking funds until pay day. 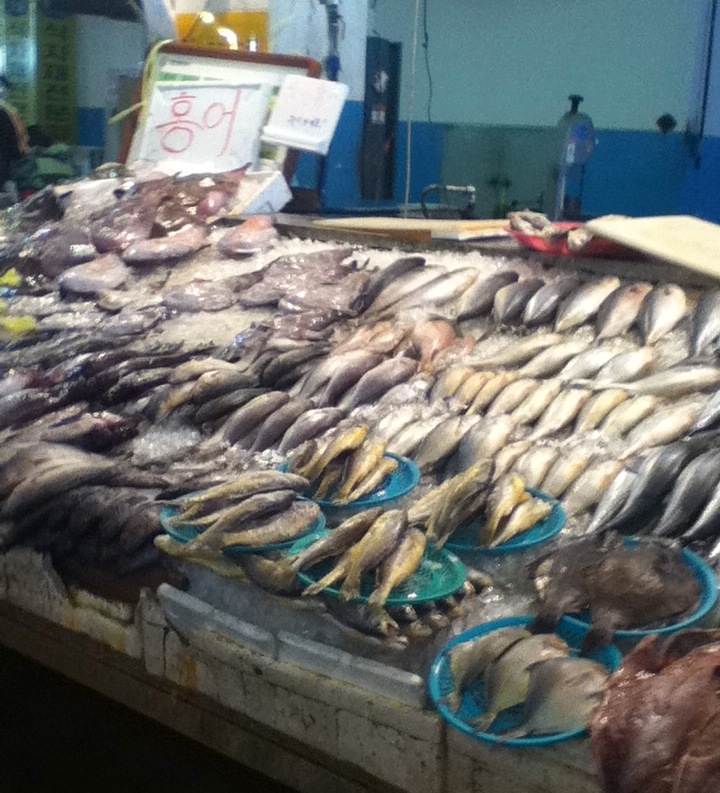 The last stop was the fish market. It’s an interesting sight to see though I was taken back. 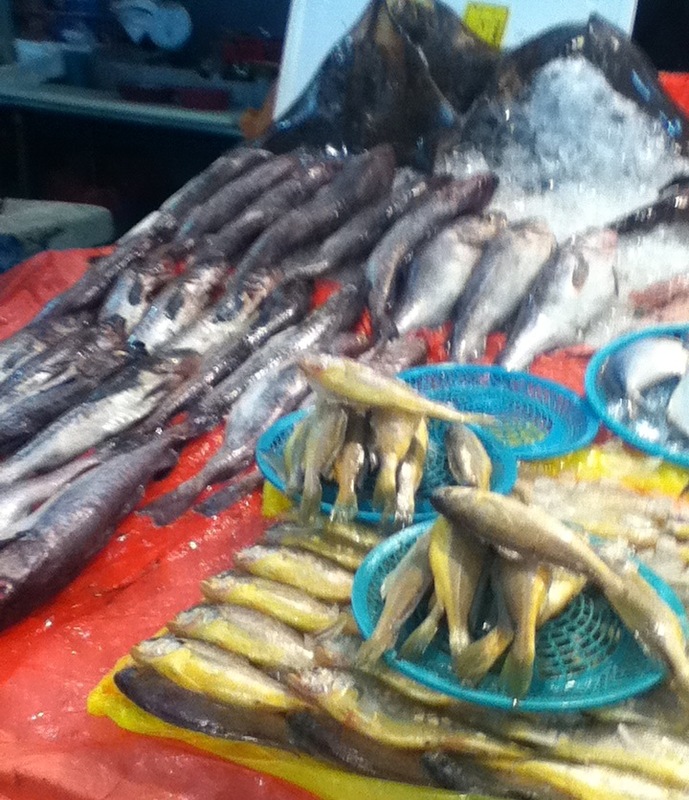 I’m just not used to seeing fish like that, and honestly I didn’t even know what any of it was except for squid and crabs. I couldn’t cook a fish if I wanted. Pretty much all fish eaten here it cooked with the bones in too. Annoying to the nth degree! What I couldn’t give for a good filet or even fish fry! 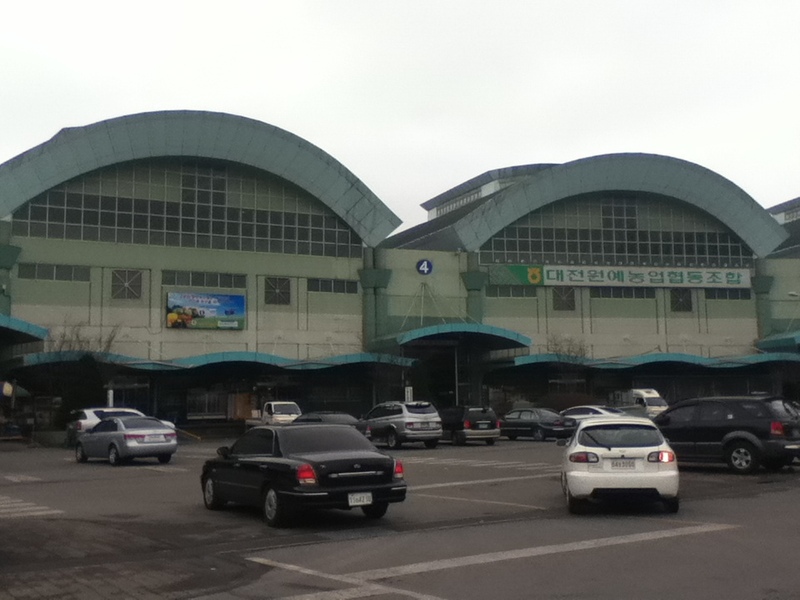 I was pleased with the market in general especially since it’s only about 10 minutes or so by train, plus I don’t have to walk far to the station either way. Once I pick up some recipes (and stop being lazy) I hope to buy quite a bit from here. My co-worker informed me, though, that there are more markets like these. 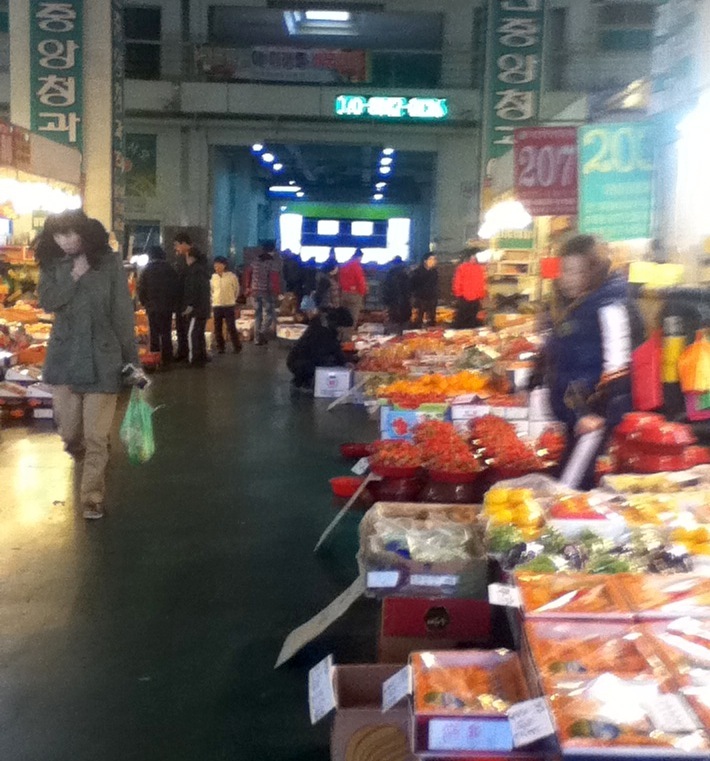 She also happens to buy meat at one of these other markets, so I hope to head there sometime in the future.